Before going pro with your shaved ice business, you need to have the right equipment for the job. After all there’s a big difference between serving 100s of customers at an event versus serving up a dozen homemade snow cones for a kids birthday party and your snow cone machine needs. In today’s post, we review the best commercial grade shaved ice machines for 2017 so you can feel more confident in your business decision. 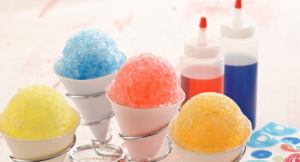 If you’re planning to get into the shaved ice business, you need a machine that will be reliable, produce a high-quality product, and enable you to crank out snow cones fast. If any of these break down, it will impact your business and affect your reputation. This machine is produced by Great Northern Popcorn, a concession supplier that is a one-stop shop for popcorn, hot dogs, cotton candy, and of course snow cones. If you’re looking for more of an entry-level snow cone machine that can be used for a business, but won’t break the bank this is an excellent option as it can be purchased for under $600 (at the time of writing) and is the lowest priced machine we feature on this list. This machine can transform 500 pounds of ice in an hour into shaved ice, which translates into about 1000 shaved ice cups every 60 minutes. If you need to make shaved ice any faster than that you have a very high-quality business problem on your hands! In addition to being able to produce a lot of snow, this is an extremely sturdy piece of equipment weighing in at roughly 70 pounds with it’s stainless steel frame. The machines dimensions are 15.5″L x 19.5″W X 25″H. There is some constructive criticism about this unit on reputable websites that allow reviews such as Amazon.com. Some feedback includes that the ice is more coarse with this machine compared to other higher price alternatives. You must also use cubed and not block ice with this machine as the block is too dense for this machine. Finally, the machine is not refrigerated so expect ice to melt overtime, depending how hot of a day it is. There’s something to be said about a machine that you could start vending with for under $1,000. Although it is not the highest performer on our list, if you’re on the fence as to weather or not you want to add shaved ice to your concession business this is a terrific way to test the waters and based on all the feedback we’ve received on this product it will operate well for years to come. There’s also a one-year manufacturer’s warranty with the machine so you really can’t go wrong if you’re just getting started. This is another reliable option for the first time vendor and a top seller. The Hatsuyuki HC-8E will plug directly into a standard 110 V wall socket. About 250 people can be served in a four hour time period with this machine and you will want to use bagged ice to insert into the machine. You will not want to use block ice with this machine as it will not be able to withstand that. Features of this machine include an on / off switch, the option to add a foot pedal for shaving, and a safety switch on the lid. There also a plate adjustment knob that allows you to choose if you would like soft and fluffy ice or something more coarse. To use the HC-8E open up the lid on top of the machine and scoop ice inside. Then just position your cup underneath the HC-8E and use the adjustment know to make ice that fits your preference. Check out the specs of this rig below! Pro Tip: Listen to this audio interview with the owner of Snowy Joey how they were able to generate over $1 Million in Revenue from selling Shaved Ice. If you’re on a budget and looking for an entry level rig the 1888 Sno-King Professional is another good option that can be owned for less than $700. For one, the 500 pounds of ice per hour can produce 500 servings per day. If you’re planning to serve 200 people or less a standard 8 ounce serving you this machine should meet your needs. That’s respectable whether you plan to operate the machine for the occasional fundraising event or if you’re planning to start a part-time shaved ice business. As mentioned in the video above, this machine will create snow that is more coarse or crunchy ice similar to what you might see served at a baseball game. You can use ice purchased from any grocery or convenience store to feed into the machine. All you need to do from there is open the feed lever and scoop the ice into the top of the 1888 Sno-King Professional. For safety purposes, this machine requires two hand operation. With one hand you will press the red button the the right side of the machine and gently pull down on the feed lever with your other hand. When you do this you will see the shaved ice fall down into the lower tray. From that point all you need to do is use the dipper to pull the shaved ice out and serve. For added convenience there is also a drain tube in the lower level of the machine that will allow you to drain any melted ice. If you’re serious about shaved ice, this is your machine. This is without reservation one of the best pieces of equipment to you invest in for your snow cone business. Although the price tag is higher than others we’ve featured here, the investment required is well worth it as you can purchase the Snowie 3000 Cube Ice Shaver for less than $3,000. In addition to being able to get through 8 pounds of ice in just over 60 second the machine is quiet and long lasting. The Snowie 3000 Cube Ice Shaver can make 1,500 servings of product per day and the blades lifetime is over 10,000 servings. The blade on this machine is also a cut above the rest. This is a bare blade that is stationary on the inside of the machine while the ice rotates into the hopper allowing the tool to shave. Although this is a long-lasting blade compared to others on the market, it’s always good to purchase a spare blade to have available in a pinch. To operate the Snowie 3000 Cube Ice Shaver take your ice and insert it into the top of the machine. After inserting the ice, you can use a foot pedal to shave the ice and let the shaved ice pour into your cup. There is a topper included with the machine as well that allows you to quickly make a nice dome shaped serving. All you need to do next is top it with the syrup of your choice. This is one of the best snow cone machines on the market and has a 5-star rating from operators. The Hatsuyuki HF-500E Block Ice Shaver is one of the most trusted machines by professional shaved ice vendors. It’s made with stainless steel and can produce almost 4.5 pounds of product per minute. If you plan on using block ice, which is a more traditional way to serve Hawaiian shaved ice, this is an option for you. Important features of this machine include a catch tray, gear oil and a bonus blade. This is a belt driven machine that weighs 83 pounds. One note, you’re going to need a sturdy surface to operate this machine. If you plan to operate at special events, you should consider getting a stainless steel table as well or something equally sturdy. The last thing you want to do is buy a cheap folding table and expect to serve customers. It won’t work! The Hatsuyuki HF-500E is too much of a beast. To operate the machine, open the front cover and turn the wheel counter clock wise. Then take your block of ice and place it into the center of the shaving table. Turn the wheel clock wise this time so the grips are set firmly into the ice. Then close the cover and turn on the machine. Voila some of the highest quality shaved ice will come out through the bottom of the machine. We hope you’ve enjoy our review of the best commercial grade snow cone machines for 2017. Are there any quality pieces of equipment that we missed? Leave your feedback in the comments.